“My cheek stung and throbbed. I remained on the floor of the cave. Belen stood between me and Kerrick. "...temper in check. She's a sweet girl," Belen said. "She's a healer, Belen. And no longer a girl. Healing Ryne is all I care about. All you should care about, as well. You know-"
I really enjoyed this novel and it wasn't what I was expecting, Maria V. Snyder is one of my favourite authors (I have her study series also) the way that she creates her worlds is very realistic and she makes it feel as though you are there with the characters. 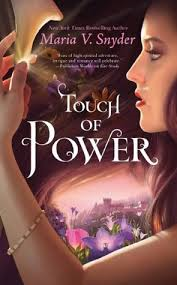 I really enjoyed this and I recommend it to Maria v. Snyder fans or anyone who enjoys a fast paced fantasy. I found Kerrick to be a great leader, Belen was very sweet and he was likeable from the start, Flea was very sweet and innocent but was also an old soul which I liked and then there was the monkey's with their witty banter which I enjoyed. They made the difficult and hard situations more bearable for the charters to endure which I loved. Oh and how could I forget Tohon, something about him I just didn't like from the start. He was way to cocky, thinking that he could have who and what he wants when it pleases him. I also enjoyed that fact that Avry could defend her self and didn't need someone to fight her battles for her. Every time Avry healed someone and took on their wounds/pain, I could almost imagine the pain she must go through every time that she heals someone. Avry and Kerrick's relationship was interesting to read and I was happy that the finally admitted their feelings for one another even if I was towards the end. The only thing I found not so great in the plot was the constant mentioning of Avry having to die in order so save prince Ryne, I think it was pretty obvious there would be a loophole and Avry would live. All in all I highly enjoyed this and I recommend it to everyone because I think that Maria v. Snyder is an amazing author and if you haven't read her books then you are definitely missing out. So pick up your copy today! !